Companies in these sectors need to update their website for ADA and GDPR compliant and without complying, it has resulted in lawsuits. We suggest updating before a letter is received. Although the compliance guideline was put into effect in 2010 by the Department of Justice, lawsuits are now starting to take place as more website visitors with disabilities are contracting law forms to commence lawsuits in these areas. It has been reported that 57 million Americans are living with disabilities of one kind or another (1 in 5 Americans). For the purpose of this blog post, I will be speaking mainly about ADA compliance. 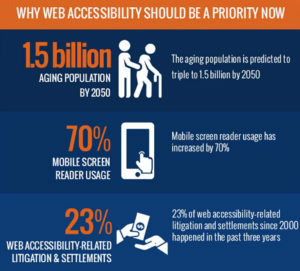 ADA stands for Americans with Disabilities Act (ADA), with all of the focus on the blind, deaf, and those with motor skill disabilities, and Americans in these categories are now surfing the internet more than ever. Also, the website needs to comply with Web Content Accessibility Guidelines (WCAG) guidelines which specify which elements need to comply with accessibility issues. What Are the Issues With a Website Not Complying to ADA. A website is designed for a site visitor with no disabilities. This means that website owners assumed that their visitors were able to see what was in front of them on the screen and they can also hear any sounds including video and audio files. The website is designed for use with a mouse and not the keyboard. Since visually impaired visitors cannot use a mouse, the website needs to be accessibly completely with the computer keyboard. Each element needs to be accessible with the TAB key which will advance the cursor from heading to image and any other piece of content. The website cannot be interpreted by a screen reader. Since visually impaired visitors use a screen reader, each element on the website needs to be identified with a screen reader. Without the proper coding, photos, for example, cannot be identified and therefore, make the website fail in being ADA compliant. Animation may cause seizures for visitors who suffer from Epilepsy. ADA analysis of your website. We will look at every headline, image, and element on your website to access if it is ADA compliant. We will determine whether or not each image, photo, and piece of text is accessible through a screenreader and can be access through a keyboard. 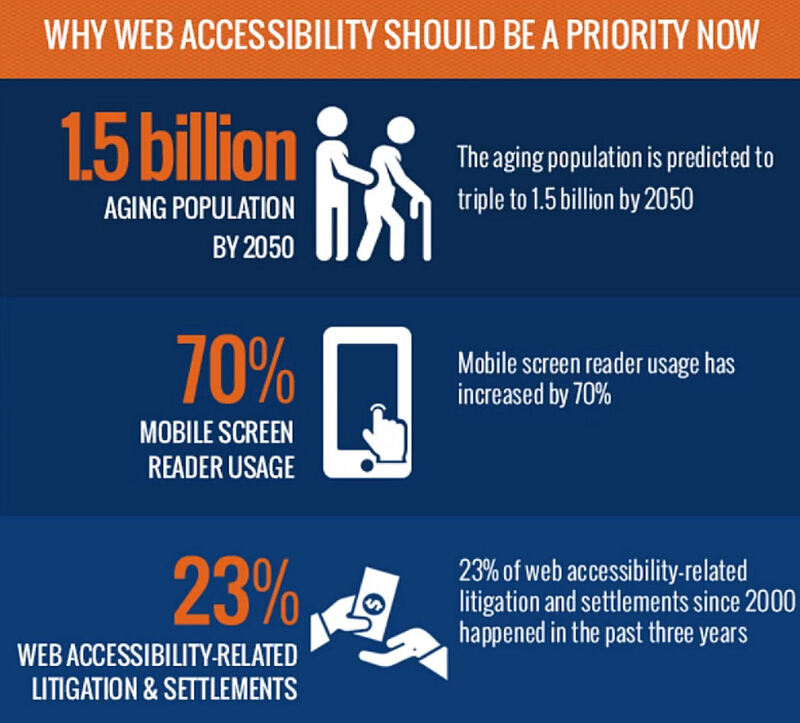 Prepare your website to become ADA compliant through a screen reader. We will convert every single item to ADA compliance and make it accessible to a screen reader for visually impaired visitors. Visitors will be alerted to which item they are looking at and the screen reader will read each piece of content to them. Make your website easy to navigate through a keyboard. When you enter the website, your computer keyboard will be able to move from one element to the next. The visitor’s screen reader will identify the element where the cursor activates. Forms have appropriate labels to identify the type of fields. So in other words, on a contact form, the visitors know that they are typing their name into the “Name” field and their email address into the “Email” field and so on. If you are interested, please contact us before you receive a letter from an attorney.